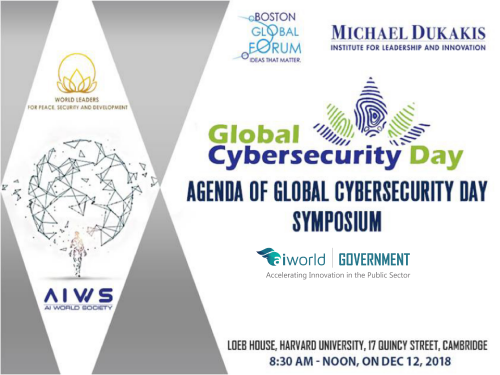 On December 12, 2018, The Global Cybersecurity Day 2018 was held at Loeb House, Harvard University, under the moderation of Governor Michael Dukakis – Chairman of the Boston Global Forum (BGF) and the Michael Dukakis Institute (MDI). The goal of Global Cybersecurity Day is to inspire shared responsibility of the world’s citizens to protect the Internet’s safety and transparency. This year’s conference revolved around the theme “AI solutions solve disinformation.” During the discussion, experts explored the current state of cybersecurity and the threat posed by disinformation, anonymous sources, and fake news, as well as the role AI can play as an effective defense mechanism against these threats to truth and the principles of democracy. Highlighted in this event were the online speeches of prominent speakers: President of Finland Sauli Niinistö, Japanese Minister for Foreign Affairs Taro Kono, and Rt. Hon. Liam Byrne MP, Member of Parliament for Birmingham. Especially, Liam Byrne delivered the first AI World Society Distinguished Lecture, which had strongly impact to the audiences. Their speeches at the symposium stated the current situation as well as called for the public awareness of protecting their safety on Internet. At this event, Dr. Thomas Creely, Associate Professor of Ethics, Director of Ethics & Emerging Military Technology Graduate Program, U.S. Naval War College, on behalf of the authors group, presented the AIWS Report about AI Ethics and published the Government AIWS Ethics Index. This proposal is expected to build common standards for an AI society around the world, from technology, laws, conventions, etc. to guarantee the interoperability among different frameworks and approaches between countries. The presentation of Cameroon Hickey from Information Disorder Lab, Shorenstein Center for Media on fake news also received much of the audience’s attention. The report brought people conscience about the definition and classification of information disorder and its challenging impact to our society.